Featuring 17-inch alloy, partial LED headlamps, leather upholstery and heated seats, the SE model line is exclusively available with the E220 CDI. 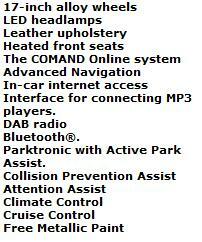 Parktronic with Active Park Assist is another feature, which can identify suitable spaces and guide you into them, while safety technologies include Collision Prevention and Attention Assist. In addition, the SE benefits from the COMAND Online infotainment system featuring in-car internet access, Media Interface, DAB radio and Bluetooth®. Naturally, the SE also comes with the electrically-powered acoustic soft-top and Aircap wind deflector that make the E-Class Cabriolet such an unforgettable top-down motoring experience.